Sunni uses a range of shipping options (Australia Post, couriers, carriers & in house delivery) to ensure value for money & to minimise the risk of goods being damaged in transit. Sunni ships Austral brand clotheslines Queensland wide. Sunni 's clothesline installation area spans the Gold Coast out to Toowoomba and up to Bundaberg. 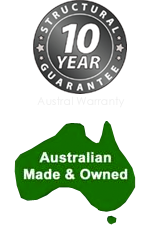 For supply of Austral brand clotheslines outside of Qld please visit Austral's website. Sunni ships its comprehensive range of letterboxes Australia wide. Sunni' s letterbox installation area spans the Gold Coast out to Toowoomba and up to Bundaberg. Sunni ships its comprehensive range of letterbox numbers, house numbers and signage both Australia wide & internationally. Sunni 's house number & signage installation area spans the Gold Coast out to Toowoomba and up to Bundaberg. Sunni ships lightweight sun hoods & awnings Australia wide. Sunni 's lightweight sun hood installation area spans the Gold Coast out to Toowoomba and up to Bundaberg. Feel free to contact us to discuss any shipping or freight enquiries.